How do we determine fit, feasibility and appropriateness of recommendations from the evidence to our setting? "Can this practice change be implemented given the current organizational infrastructure?" " What additional actions and resources are needed?" Would this change improve clinical outcomes, patient or staff satisfaction, the cost of care, or unit operations? Are the findings in the evidence consistent? How applicable are the findings to your practice setting? More guidance for this process can be found on Appendix H: Evidence Synthesis and Recommendation Tool. Dang, D., & Dearholt, S. (2017). Johns Hopkins nursing evidence-based practice: model and guidelines. 3rd ed. Indianapolis, IN: Sigma Theta Tau International. An action plan is a detailed plan of how you will carry out a project and reach your objectives. It includes the who, what, where, and when of your project. There are several different models for creating an action plan, but they all share elements in common. They each consist of steps needed to accomplish a goal, a timeline of when those steps will be accomplished, and who is responsible for each of the steps. One easy way to implement an evidence-based pilot project is to follow the PDSA cycle. 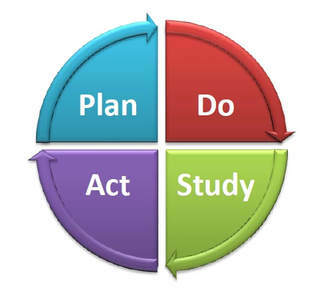 The Plan-Do-Study-Act model of improvement was developed by the Associates for Process Improvement. The model consists of three questions which guide the project, and a four-part process for implementing change. ​The answer to the first question should be your clinical concern from the "Ask" phase of the EBP process. The third question, "What change can we make that will result in improvement? ", will be the evidence-based practice that you discovered in the "Acquire" and "Appraise" part of the process. The second question, "How will we know a change is an improvement? ", involves deciding what project metrics will indicate success. What's your goal? If your clinical concern was about hand hygiene compliance among health care workers, you might say your goal is to increase their compliance rate to 75% within 3 months. For more information on measuring project success, go to the Institute for Healthcare Improvement website. The planning stage of the PDSA cycle involves developing the change or test you will be implementing. This can be done with the input of your project team. What steps will be needed to put the change into place? Who will be responsible carrying out pdsa each step? How and when will you inform the team of the project progress? You decide to make an adjustment to the change, based on the outcomes of your pilot. You'll start the PDSA cycle at the "Plan" step again. You decide not to carry out the change elsewhere, and end the project. ​Below is a handy project charter worksheet that you can download to help you with the project planning process. It will help you organize your plan to help make the project implementation easier. You and your mentor can work on this together. Problem Statement- This is similar to your PICO clinical question. Results of the Problem- Why is a change in practice needed? Collecting baseline data may be necessary before completing this section. Baseline data collection can be as simple as noting the number of events on your unit related to the issue you are trying to solve within a given time period. Include a summary the literature you have found supporting the evidence-based change you are hoping to effect. Goal - The desired outcomes of your pilot related to your clinical question. How will you know the change in practice has successful? These must be SMART goals (Specific, Measurable, Achievable, Relevant, and Time-bound). Project Scope- Where will your project begin and end? What should be included? (For example, including only patients on a specific unit with a specific medical condition.) What assumptions are you making? ​Project Summary- Briefly describe your pilot project in a clear manner so that others can easily tell what you intend to do. Team Members- Who is working on this project with you? Who will be helping you to implement this project? Project Stakeholders- The project stakeholders are the people who will be affected by the project. This might include patients, families, nursing staff, and other healthcare workers. Timeline- When will the project start? How long will this project take? Key Milestones- These are the steps you must take to implement the project. For each action item, you will need to specify the person or persons responsible for completing it, and the date when the action must be completed by. ​You will need to develop a communications plan for your project. The communications plan will detail your approach to informing stakeholders about the project and its progress. Manner of communication (holding or attending a meeting, sending an email, publishing an update on the intranet)? Frequency of communication (daily, weekly, monthly, at the project close)? What information will be included in the communication? Who is responsible for the communication for this stakeholder group? ​If your project plan includes the purchase of supplies or equipment, and/or requires staff time outside of their normal duties, you will need to develop a simple budget to submit along with your project charter and communications plan. Below is a template that you can use to help develop your budget. After choosing which professional conference would be a good fit for your poster, you will need to submit an abstract to their selection committee. Happell (2007) provides some guidance for nurses in preparing abstracts. ​Once your abstract has been accepted by the conference, the next step is to begin planning your poster. Sherman (2010) has created a guide for nurses on creating effective conference posters. Sherman, R. (2010). How to create an effective poster presentation. American Nurse Today, 5(9), 13-15. Free poster templates are available in PowerPoint format online to enter your poster information into. Below are a number of sites on which you can find free templates. You will need to download the file to your computer and then open it in PowerPoint to enter in your content. For technical support in using these templates, please reach out to the librarian at library@ellismedicine.org. After you create the poster in PowerPoint, you will need to have it printed. There are a number of online sites that can print them for you from the PPT file, or you can reach out to the marketing/graphic arts team for assistance. ​Another method of disseminating your research findings is to make a presentation. Many professional conferences invite presentations from researchers. Typically, these presentations take the form of a PowerPoint presentation. Again, you'll need to submit an abstract for your presentation to a selection committee. Background- Why did you do this project? What was your PICO question? Literature Review- What were the key points you learned from conducting a review of the literature? Methodology/Implementation- How did you apply the evidence in your setting? Results- What did you find? Discussion- Why were these findings important? How well do these findings translate to other settings? Do you have any recommendations? ​​Below are some resources to help you develop an effective speech and presentation materials. If you decide you'd like to submit your research findings in the form of an article to a journal, below are a number of books that can help guide you through the writing process. Keep in mind, each journal has its own formatting and publication requirements. Be sure to refer to the journal's guidelines for submitting articles. Oermann, M. H., & Hays, J. C. (2016). Writing for Publication in Nursing, Third Edition. New York, NY: Springer Publishing Company. Available through EBSCO e-Books. Saver, C., & Sigma Theta Tau, I. (2014). Anatomy of Writing for Nurses, Second Edition. Indianapolis, IN, USA: Sigma Theta Tau International. Available through EBSCO e-Books.